SINGAPORE – Gold’s sizzling. Investors pushed prices of the haven to highest in a month as the US and China exchanged blows on trade, and President Donald Trump installed the hawkish John Bolton as his new national security adviser. 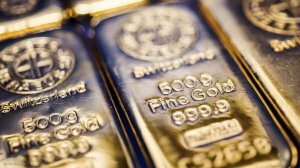 Bullion gained midweek as the Federal Reserve stuck with plans to raise rates only three times this year. It moved higher Friday as the long-expected trade fight stoked concern that global growth will slow, and Bolton’s ascent added to risks of a more muscular US approach to some of the world’s hotspots, especially Iran and North Korea. Bullion for immediate delivery jumped as much as 1.1% to $1 343.27/oz, the highest since February 20, and was at $1 342.43 at 10:50 a.m. in London. Gold’s up 2.1% this week, heading for the biggest gain since February 16. It jumped 1.6% on Wednesday after the Fed signaled the pace of tightening won’t accelerate this year. There are other strong signs that bullion is winning favor with investors again. Global holdings in exchange-traded funds have risen to the highest level since 2013, while traders and analysts in a Bloomberg survey are the most bullish on the metal’s outlook in almost two months. Bolton – a former US Ambassador to the United Nations who’s famed for his hawkish views, blunt comments, and role as a strong supporter of the US invasion of Iraq – will replace H.R. McMaster in the national security adviser’s position. His appointment makes new sanctions on Iran more likely, which would further unsettle the market and lend even more support to gold, analysts at Commerzbank AG said in a note. The Bloomberg Dollar Spot Index fell 0.6% this week, while equity markets in the US and Asia tumbled after tariffs were announced. While there’d been concern among some investors that the Fed may favour four hikes in 2018, the bank’s guidance signaled policy makers are still sticking at three.